SCALLAN, THOMAS (the name is sometimes written Scallon), Roman Catholic priest, Franciscan, and vicar apostolic; b. c. 1766 in Churchtown, County Wexford (Republic of Ireland); d. 28 May 1830 in St John’s. At an early age Thomas Scallan, who came of a respectable family, was placed under the care of his uncle, the Reverend Thomas Scallan, at the Franciscan convent in Wexford, where he received a classical education. In 1786 he entered St Isidore’s College, Rome, to complete his studies for the priesthood. He remained there as lecturer in philosophy until 1794, when he returned to the Wexford friary. There he worked as a professor of classics with Father Patrick Lambert* in the Franciscan Academy, a preparatory seminary for candidates for the priesthood. For some years Scallan was principal of this institution, apparently highly regarded, and from 1802 to 1805 he served additionally as guardian (superior) of the Wexford convent and definitor (disciplinarian) of the Franciscan order in the province of Leinster. Scallan remained at Wexford until 1812, when Lambert, now vicar apostolic of Newfoundland, secured his assistance as curate in St John’s. In 1814 Lambert’s ill health led him to recommend Scallan as his successor, and in this connection the two travelled to Ireland in the autumn of 1815. On 26 Jan. 1816 Scallan was named titular bishop of Drago and coadjutor to Lambert with the right of succession, and on 1 May he was consecrated in the parish church in Wexford. Later that year Scallan returned to Newfoundland. When Lambert, who had remained in Ireland, died on 23 September, Scallan automatically became vicar apostolic of Newfoundland (although formal notice of his predecessor’s death did not reach him until the following spring). Major difficulties immediately confronted Scallan. Attracted by high wages in the booming fishery, thousands of Irish had immigrated to Newfoundland between 1811 and 1816, increasing the Catholic population to some 21,000, double that of five years earlier, and now half the total population. However, by 1816 the economy had suffered a sharp reversal and destitution was widespread. In St John’s alone during the winter of 1816–17, 1,800 people were on relief and, like others who were better off, Scallan daily fed ten of the poor at his own table. Violence and crime abounded, and upon the Catholic priests fell a major responsibility for the enforcement of law and order. The bishop had to provide additional clergy for the increased population, a task made difficult by the prevailing poverty. Nevertheless in 1817 he ordained Nicholas Devereux to the priesthood, the first such event to take place in Newfoundland. By that year, too, Scallan had established a new parish at Kings Cove, Bonavista Bay, and had assigned assistants to the parishes of Harbour Grace and Placentia. There were then ten priests on the island, as many as he felt could be supported adequately. Although Scallan tried to maintain this strength throughout his episcopate (he left that number at his death), he did so only with difficulty. Those clergy he did have, however, were usually regarded as “pious, learned and liberal.” They were also active men, travelling constantly and usually covering extensive territories. William Herron*, for example, the curate of Placentia, resided at Burin and from there cared for the inhabitants along the whole south coast of the island, including the Micmacs of St George’s Bay. Scallan’s priests were energetic, too, in continuing to make numerous converts among the English settlers of Newfoundland, especially in Placentia and St Mary’s bays, and to some extent along the north coast. Still, it was not easy to secure clergy of quality. Over the years Scallan had to dismiss two priests for drunkenness and immorality, and one left Newfoundland after his nephew was hanged for murder. He also had problems with the rebellious priest John Power. When Power, who had been suspended in 1812 by Lambert, dared in 1820 to celebrate mass in Labrador, Scallan publicly excommunicated him and denounced him as “a rock of scandal and a stumbling block to the faithful.” In retaliation, Power brought a lawsuit against the bishop alleging financial loss as a result of his dismissal. It was unsuccessful. By then Power had few followers; he died in 1823, apparently reconciled to the church. 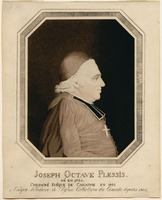 From the beginning of his episcopate Scallan maintained a close relationship with Bishop Joseph-Octave Plessis of Quebec. As in Lambert’s time, each bishop appointed the other his vicar general, an act that would be repeated in 1826 with Plessis’s successor, Bernard-Claude Panet; Scallan regularly corresponded with Plessis and then Panet regarding the affairs of the North American church. Their collaboration was especially useful in providing for the Catholics in Labrador. As early as 1814 Plessis had suggested to Rome that Labrador and Anticosti Island be detached from the diocese of Quebec and joined to the vicariate of Newfoundland, because they had been under the civil government of Newfoundland since 1809, and Plessis felt they could be better served from there. Scallan formally agreed to this change in 1819, and on 1 Feb. 1820 a papal decree was issued transferring to the vicariate of Newfoundland Anticosti and the territory of Labrador north of the St John River (Rivière Saint-Jean, Que.). Scallan had already used his faculties as vicar general of Quebec to send a priest to the coast of Labrador in the summer of 1818, and from 1821 he seems to have sent missionaries there annually for the fishing season. Since he had nobody qualified to care for the Montagnais and Naskapis, both Plessis and Panet, at Scallan’s request, continued to send priests to these native groups. On 25 March 1823 Scallan suffered a stroke which temporarily left his right side paralysed. Having recovered sufficiently by June to follow his physician’s advice to go to a warmer climate, he sailed for New York, leaving his vicar general, Thomas Anthony Ewer, in charge of the mission. The bishop spent the next several months on the continent, chiefly in New York City and Washington, D.C., but also visiting fellow bishops in Baltimore, Philadelphia, and Boston. On his voyage home he spent three weeks at Halifax. Nova Scotia had been without a resident bishop since the death of Edmund Burke* in 1820, and Scallan confirmed nearly 600 people in Halifax. He returned to Newfoundland in September, his health restored, but his doctors cautioned him against wintering in a cold climate and in November he departed again, this time for Italy. Scallan spent the winter of 1823–24 in Rome, concerning himself principally with the affairs of Nova Scotia. He obtained special faculties for Father John Carroll, then administering the colony’s vicariate, and made urgent representations that Father Denis Lyons, an Irishman, be named bishop. 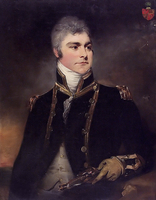 (Lyons did not accept the appointment in 1824, and later that year William Fraser* was nominated to fill the position.) The spring and summer of 1824 Scallan passed in England and Ireland, and he returned to Newfoundland only in September. By this time his health had greatly improved, although he was never again completely well. A further journey for health reasons was made in 1826 to the spa at Cheltenham, England. Scallan also enjoyed an excellent personal relationship with Cochrane and with the previous governor, Sir Charles Hamilton*, a relationship maintained despite the fact that Scallan, unlike his predecessors and his successor, never received a government salary. Although, with Hamilton’s staunch support, he applied for a salary in 1819 and again in 1823, the British government chose to ignore the requests. Thereafter Scallan apparently decided not to pursue the matter, possibly preferring to retain his independent status. Notwithstanding his conciliatory disposition, Scallan could be firm in upholding Catholic rights. In 1817 Governor Francis Pickmore* had introduced the first Newfoundland Marriage Act in an effort to prohibit the celebration of marriages by Methodist and Congregational clergy, but before doing so he felt obliged to assure Scallan that the traditional right of Catholic priests to solemnize marriages would be fully protected. The resulting act was vague and served only to anger dissenters who saw in it a tendency “to establish popery and to persecute Protestantism.” Consequently the question was reopened in 1823. The draft of the new legislation included clauses that would permit both dissenting ministers and Catholic priests to perform marriages, but only when it would not be “convenient” to obtain a Church of England clergyman. When the draft reached Newfoundland from the Colonial Office, Catholics were outraged. Scallan led a massive protest against the proposed condition, claiming it was unjust and vexatious, and in petitions to the king, the Colonial Office, and the House of Commons, the Catholics of Newfoundland denounced it as “the most degrading and distressing infliction that could be laid upon them.” Supported by Governor Hamilton, these representations carried great weight in London, and they ensured that the Newfoundland Marriage Act of 1824 left Roman Catholic priests on an equal footing with the Anglican clergy. The Catholics’ only remaining objection to the act was the registration fee it introduced. Although Newfoundland Catholics had shown that they were a group whose interests could not be ignored, the net result of the two acts was to arouse sectarian controversy and to leave particularly embittered the growing body of Methodists, who in the final version of the law were still excluded. Bishop Scallan was also concerned about the education of Roman Catholic children. He apparently endorsed the principle of schools open to pupils of all persuasions with religious instruction given separately outside school hours. He certainly supported the non-denominational St John’s Charity School, which was organized along such lines. He approved, too, in 1826, the foundation on the same basis of the Benevolent Irish Society’s Orphan Asylum Schools at St John’s, even though the student body was almost entirely Catholic, and a similar school at Harbour Grace. However, when the Newfoundland School Society, an organization based in Britain and dominated by low church Anglicans such as Samuel Codner*, began to provide schools on the island in September 1824, Scallan invoked a Vatican prohibition against Bible society schools to ban the attendance of Catholic children at the new establishments. He seems to have feared, probably correctly, that despite protestations of non-sectarianism these schools were really aimed at proselytism. Substantial government assistance went to both the Newfoundland School Society and the Society for the Propagation of the Gospel, while the Orphan Asylum Schools, the largest in the colony, had to be maintained solely from voluntary subscriptions. This situation irritated its supporters throughout the remainder of Scallan’s episcopate. Several applications to London for public funds, and even Governor Hamilton’s endorsement, failed to obtain any consideration. The most contentious issues of Scallan’s time, however, were undoubtedly Catholic membership on the Council of Newfoundland and Catholic emancipation generally. The Council, an appointed body, was created by instructions included in Cochrane’s commission as governor, as a half-measure toward local government. At its first session, in October 1825, the military commander in Newfoundland, Lieutenant-Colonel Thomas K. Burke, whose position entitled him to membership, took the oaths of office and allegiance but as a Catholic refused the oath of supremacy and the declaration against transubstantiation. Cochrane felt that these could be dispensed with, as in Lower Canada, but the justices present doubted the legality of this procedure and Burke was not seated. The governor immediately made it clear to Colonial Secretary Lord Bathurst that Burke’s exclusion from Council could only give offence to the Roman Catholic majority in Newfoundland. In fact, Cochrane obviously intended to constitute a representative body, for within a few months he officially proposed for membership both Scallan, as “Catholic Bishop of Newfoundland,” and Patrick Morris*, a leading Catholic merchant. Cochrane described Scallan as “entitled to this distinction from the rank he holds in the Catholic Church . . . as from his private character, which is marked by great liberality of principle, and moderation of conduct.” He was not unmindful either that the bishop’s influence would command Roman Catholic support for the Council and its decisions. 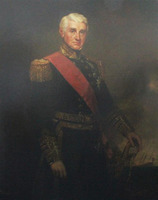 Bathurst himself had sought to omit the oath of supremacy and the declaration when the Newfoundland commission was in. preparation, but it had been the opinion of the English attorney general that, Lower Canada notwithstanding, the constitution prevented the framing of a commission without these requirements. In any case they were now included, and Bathurst felt unable to submit to the king the names of the Catholic nominees. Although the proposal of Scallan and Morris for membership was never general knowledge, Burke’s exclusion sparked Catholic resentment, and public agitation was prevented only by the bishop himself, who feared that it would destroy the religious harmony of the colony. Nevertheless, behind the scenes, Morris, apparently with Scallan’s support, sent the governor a memorial asking that Newfoundland’s Catholics be accorded the same rights and privileges enjoyed by their brethren in other colonies. Despite Cochrane’s endorsement of this position, London took no action, and locally the composition of the Council remained a divisive factor. Pressure for redress of these grievances may have been reduced by the growing expectation of passage of a Catholic relief bill for British subjects generally. Such legislation received royal assent on 13 April 1829, and upon receipt of the news in Newfoundland Scallan declared 21 May a day of public thanksgiving. In St John’s and other major towns throughout the island bands, parades, and special church services evidenced the pleasure of Catholics that the penal restrictions of centuries had been lifted. However, their joy was short-lived; by December the colony’s attorney general, James Simms*, and the Supreme Court of Newfoundland had concluded that the relief bill was inoperative there. Newfoundland Catholics were informed that the acts of parliament which in 1825 were held to make it necessary that the governor’s commission include religious disqualifications for Catholics, did not, after all, apply to Newfoundland. Thus, neither did their repeal. The only legal basis for the disabilities was Cochrane’s commission. Issued under royal prerogative, it could not be altered by any act of parliament, not even the new Catholic Relief Act. Newfoundland, with a Roman Catholic majority, was now the only British colony still officially under the old penal laws. Understandably, its Catholics entertained “angry and highly irritated feelings” and, as a result of massive protest meetings at Catholic churches, strongly worded petitions were forwarded to the British parliament. Although Cochrane and Chief Justice Richard Alexander Tucker* insisted that the matter required urgent attention, London was again indecisive, and Catholic emancipation did not finally come to Newfoundland until the proclamation of representative government and the calling of the first elections on 26 August 1832. In the mean time a new and major source of religious grievance had been allowed to develop. The last years of his life saw Scallan suffer greatly from physical and mental infirmity. By 1827 his nervous condition had improved somewhat, but his bodily health was failing. In that year he applied to Rome for a coadjutor with the right of succession, submitting as his terna the names of Michael Anthony Fleming*, James Sinnott, and Timothy Browne*, all priests of the Newfoundland mission. Fleming had been his curate in St John’s since 1823 and, despite what Fleming referred to as “our repeated differences” over religious instruction at the Orphan Asylum Schools, lay control of church repair funds, and attendance at non-Catholic services, he was Scallan’s first choice as his successor. 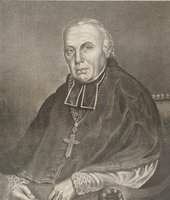 Bishop Panet was consulted by Rome, but although he made a favourable comment on Sinnott, who had studied at Quebec, he disqualified himself as having insufficient knowledge. 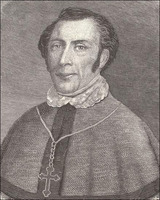 Fleming was formally appointed coadjutor bishop in 1829, and Scallan had the honour of performing the first episcopal consecration in Newfoundland on 28 October of that year. By then Scallan had become almost incapable of fulfilling his duties. “My nerves are a good deal out of order,” he wrote; “formerly I could write in straight lines, and tolerably well, but now it is quite otherwise.” His mind clear to the end, however, he finally succumbed to his illness on 28 May 1830. He was buried in the yard of the old chapel, but his remains were transferred to the new cathedral in 1850. Scallan’s death was an occasion of real grief for the Newfoundland people. Shops closed; ships’ flags flew at half-mast. Scallan was buried as he had lived, with Bishop Fleming and Frederick Hamilton Carrington, the Anglican rector of St John’s, standing side by side as chief mourners, with Methodist and Anglican clergy joining Catholic priests in the procession, and with 7,000 persons “of every religious persuasion” taking part in the funeral. He was a beloved bishop, whose piety, kindness, and intelligence had won him universal respect, and who had guided his church wisely through a difficult period. Fleming, no sycophant, called Scallan “the most zealous prelate that ever sat, or perhaps ever will sit, in the episcopal chair of Newfoundland.” It was perhaps to his greatest credit that, while he could be adamant in defence of essential Catholic interests, yet he sought always to live in harmony with others. An obituary in the St John’s Newfoundlander seemed to sum up his qualities when it noted: “With his various accomplishments, he combined a lofty zeal for the advancement of religion, wholly free, however, from that bias of intolerance which is some times found in minds deeply imbued with religious feelings.” In his latter years his illness obviously hampered him as a bishop and public leader. This was unfortunate, perhaps the more so for one naturally moderate. It must remain a matter for speculation whether in the eventful years from 1825 to 1830 more forceful approaches by the bishop himself might have prodded the government into action concerning Catholic rights, thereby defusing that sense of injustice so central to the bitter sectarian strife which followed his death. Scallan’s ecumenical spirit occasioned considerable controversy. Indeed, Michael Francis Howley*, who attributed such ecumenism to a mental weakness, stated flatly in his Ecclesiastical history of Newfoundland that Scallan was censured by Rome, but as the censure arrived only when he was near death, it was never communicated to him. Indeed, this story became a popular myth, encouraged by the striking and unusual monument of Scallan by the Irish sculptor John Hogan in the Cathedral of St John the Baptist in St John’s, which had been commissioned by Fleming. It depicts Scallan on his deathbed receiving the last sacraments from his successor and was held to show his reconciliation with the church. However, no evidence of a censure exists either in the Vatican archives or in those of the archdiocese, and Fleming failed to mention it in reporting Scallan’s death to Rome. In fact, the earliest foundation for the story seems to be an account of Scallan’s activities found in Fleming’s Relazione della missione cattolica in Terranuova, which was coupled with a general reference to censures imposed during the Reformation on Catholics who frequented heretical services. In times less tolerant than his own, Scallan’s ecumenism had likely become an embarrassment which had somehow to be accounted for. AAQ, 12 A, K; 210 A, VIII, X, XIII; 10 CM, III–IV; 30 CN, I. Arch. of the Archdiocese of St John’s, Scallan papers. Archivio della Propaganda Fide (Rome), Scritture riferite nei Congressi, America Settentrionale, 2 (1792–1830). PRO, CO 194/51, 194/55, 194/59–62, 194/66–76, 194/78, 194/80–81, 194/83, 194/87, 194/92; CO 195/17–18. USPG, C/CAN/Nfl., 3–4; C/CAN/NS, 9. “Documents relating to Wexford friary and parish,” comp. Pádraig Ó Súilleabháin, Collectanea Hibernica (Dublin and London), 8 (1965): 126–27. M. A. Fleming, “Bishop Fleming to the Very Rev. Mr. Spratt, of Dublin . . . , Sept. 24, 1834,” Catholic Magazine and Rev. (Birmingham, Eng. ), 6 (1835): v-xii; Relazione della missione cattolica in Terranuova nell’America settentrionale . . . (Rome, 1837). Patrick Morris, Remarks on the state of society, religion, morals, and education at Newfoundland . . . (London, 1827). Newfoundland School Soc., [Annual report] (London), 1826–27; Proposals for instituting a society for the establishment and support of schools in Newfoundland (London, ). James Sabine, A view of the moral state of Newfoundland; with a particular reference to the present state of religious toleration in the island (Boston, 1818). Newfoundlander (St John’s), 27 Nov. 1828; 14, 28 May, 29 Oct., 31 Dec. 1829; 28 Jan., 3, 10 June 1830; 30 Aug. 1832. Newfoundland Mercantile Journal, 11 April 1817; 3 March 1818; 16 Sept. 1824; 5, 18 Jan., 5 Oct. 1826. Public Ledger, 22 May, 5 June 1829; 11 June 1830. M. F. Howley, Ecclesiastical history of Newfoundland (Boston, 1888; repr. Belleville, Ont., 1979). Johnston, Hist. of Catholic Church in eastern N.S. J. T. Mullock, The Cathedral of St John’s, Newfoundland, with an account of its consecration . . . (Dublin, 1856). Paul O’Neill, The story of St. John’s, Newfoundland (2v., Erin, Ont., 1975–76). Raymond J. Lahey, “SCALLAN, THOMAS,” in Dictionary of Canadian Biography, vol. 6, University of Toronto/Université Laval, 2003–, accessed April 24, 2019, http://www.biographi.ca/en/bio/scallan_thomas_6E.html.